Waltzing Waters ®, Inc. creates spectacular productions for both indoor and outdoor venues, each featuring distinct personalities, advantages, and opportunities. For indoor venues, advantages include a controlled environment where shows can be seen equally well day or night, rain or shine. Outdoor venues offer the potential for much larger displays with greater height, plus the added benefit of aesthetically pleasing natural surroundings. Every home of distinction offers something special in terms of view, architectural uniqueness, or perhaps landscaping. 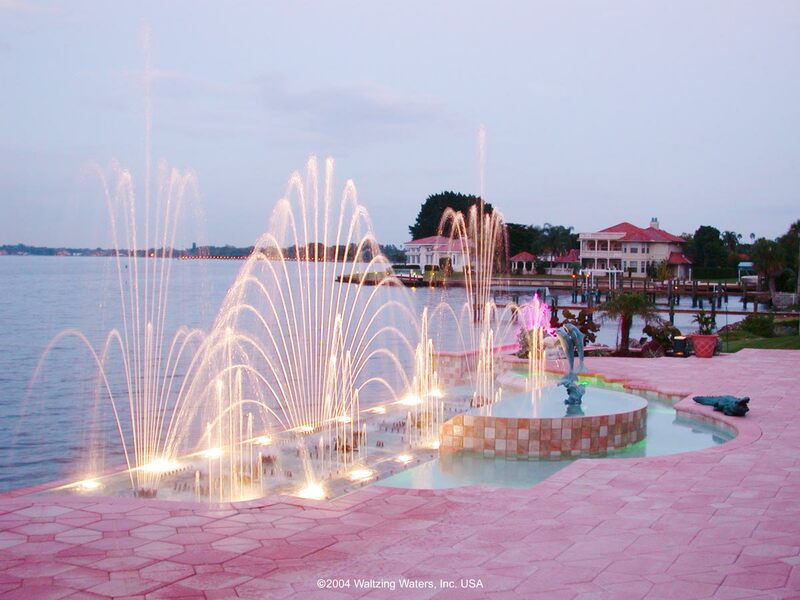 Owners of fine homes can now add a truly unique and entertaining feature to their properties: A sophisticated and spectacular musical fountain show by Waltzing Waters ®, Inc. Though smaller than our lake or auditorium sized shows, they still provide an incredible sight, thrilling both owners and their guests. Pictured here is a residential installation featuring a Waltzing Waters ® Classic Series fountain system. The control cabinet is housed in a closet as seen at right. All of our fountain series can be sized and adapted for home use. The owner of this property wanted to do more than provide his guests with something nice to look at. He wanted his guests to leave with a truly memorable experience. Family and visitors are amazed as the multicolored waters burst into the evening sky, twisting, swaying and leaping in perfect synchronization with music. Since its first showing, the owner of this unique residence has entertained a number of guests with the same gratifying results. He has achieved his goal. Not only are his guests provided with comfortable surroundings, but also a truly memorable experience to take with them. To see video clips of a Classic Series fountain like the one above, click here. The Classic Series is a lower cost alternative, featuring about half the effects of a Liquid Fireworks ® show. Perfect for smaller commercial venues, this series is also ideal for upscale residences. To see a residential installation, click here. All Waltzing Waters ® shows are custom manufactured to meet the specific needs of the customer. Beginning at 9 meters (27 feet) in length, shows can be sized for any application including, shopping malls, theatres, stadiums, parks and lakes. THE EXPERTISE OF THREE GENERATIONS COMES WITH EVERY WALTZING WATERS® SHOW. AND THE FAMILY TRADITION CONTINUES TODAY.